TweetStarting off as a new web developer you’ll need to learn a lot of tools, and while we can’t cover every tool, we can learn about what is perhaps the most important tool any web developer should have in their arsenal: The Chrome DevTools. If you’re unfamiliar with it, the Chrome DevTools is a set of web development tools built into the Chrome browser. Every major browser has a similar development tool, but I’ll be exclusively talking about the Chrome DevTools. You can still follow along on another browser, but it won’t be a perfect match. 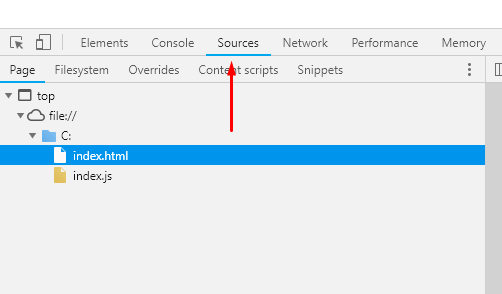 You might have already accidentally opened the DevTools when browsing on the web, but for the sake of thoroughness, you can launch the DevTools by pressing F12 or right-clicking on a webpage and pressing the Inspect menu button. 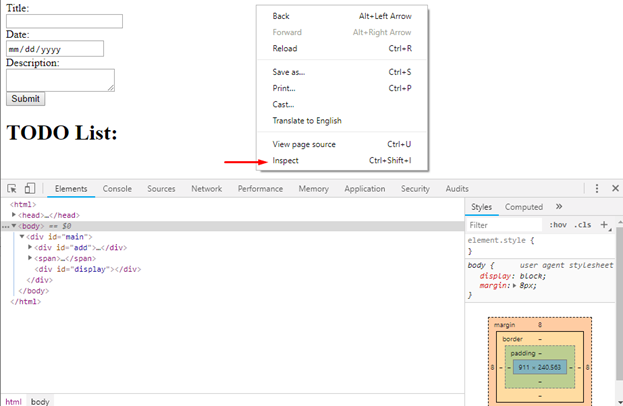 The first thing you’ll see when you open the Chrome DevTools is the HTML and CSS used on the webpage. 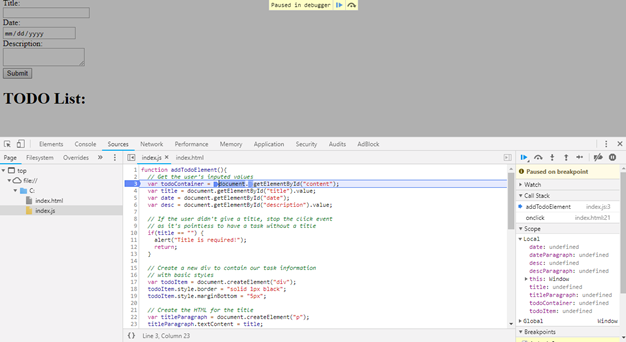 That’s as far most people will get, but do you know that the Chrome Dev tools can show you even more? 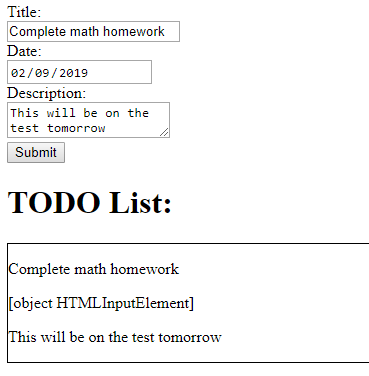 To get us started on learning how to debug with the Chrome DevTool, we’re going to create a simple To-do list app. We’re not going to implement any extra features except for adding a new task into our list. As you can see, index.js holds one function. 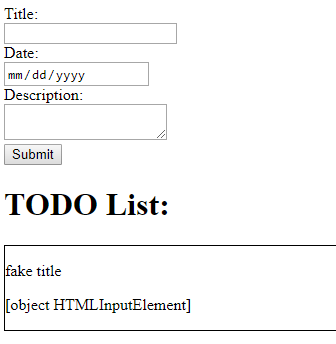 This function reads the user’s inputs, creates a task, and adds it to our webpage. Uh oh, our date doesn’t look correct. We have a bug! To figure out what’s causing the bug, we need to investigate the code causing the bug and figure out where the problem is appearing. In this example, we only have one function, so it’s obvious where our offending code will be. The Sources tab shows us the files being used by our app. In this instance, the files are index.html and index.js. 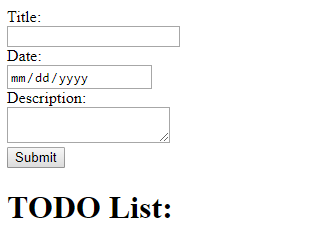 The code that we want to debug is in index.js. Click on it and you’ll see that it is indeed the same file we created above. With our code open, we now need to set our breakpoint. This is done exactly like how you would do it with any other IDE. Click on the line number on the left side to create a breakpoint. For our demo, click on line 3. Now, all we need to do is get that code to run. Clear your inputs for this next example. Click on the Submit button in our webpage and to hit our breakpoint, causing us to pause on line 3. Resume (F8)– Resume will continue the execution of your code, skipping everything until either the next breakpoint or until the code finish executing. Step Over (F10) – Step Over will execute the line you’re on and move you to the next line. If the line you’re on is executing a function, you’ll step over it and move to the next line. Step Into (F11) – Step Into is like Step Over, but Step Into will make you go in the function and allow you to also debug the newly executed function. Step Out (Shift + F11) – Step Out is used alongside with Step Into. It allows you to jump out of the current function that is being executed and go back to the code that executed the function. Start walking through our code. Hit Step Over four times so that you are at line 10. 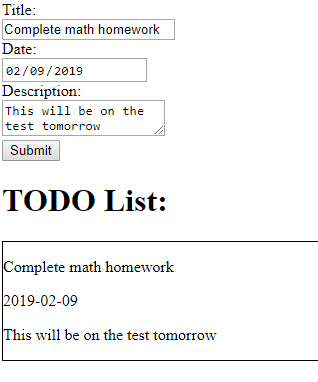 At this point, we’ll notice that our title variable is empty, which means we’re going to enter the if statement and stop the execution of our code without getting to the bug we’re looking for. Let’s pretend we’ve spent a lot of time debugging our code and don’t want to stop here. Luckily for us, there are some tricks that we can do to get around this. Let’s pull up our Console. Typing our values in the console, we can see our bug. Why is date returning us an input instead of a value? With that hint in mind, we now know we should look at where the value is being assigned. 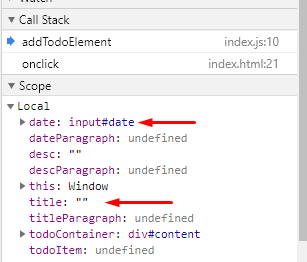 If we look there, we can see that we’ve made a mistake and used our input element as our date instead of getting the value from the input. If we were to look at the Scope window on the right of our source tab, we can see the same information that we printed. Bingo! Our value is empty because we didn’t set anything in there, but at least it’s not that hideous [object HTMLInputElement]! Before we stop debugging, remember what we talked earlier, about how we can pass the if statement? We can do that by modifying our title variable from the console. In the console, type title = "fake title"
If we go back to our code and highlight title, we’ll see that our title variable has the new value we set it! If you click Step Over, instead of going into the if statement, we’ll skip to line 17. This is a useful trick to try different inputs in the debugger without having to stop the debugger and manually try new values in the app. Our "fake title" value is used for the task item. 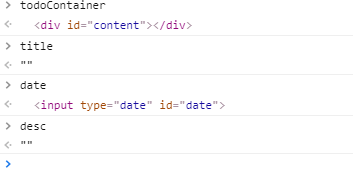 We would see that we assign our date input HTML as the textContent instead of its value. With that, our web app works like we expect it to! Great work! Going through this small example, I hope I have shown you the power of the Chrome DevTools and how it can simplify debugging. 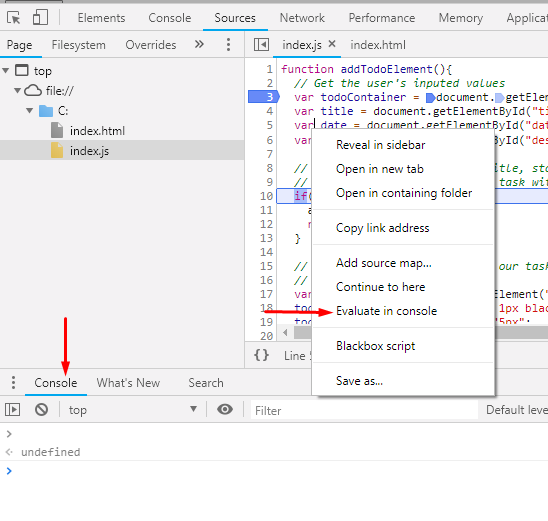 How to use the Console with the debugger to help navigate and understand why your code is acting the way it is. With this knowledge, you should be ready to start debugging your own application and help make the web a better, bug-free place! Joshua is a passionate software developer working in the Seattle area. He also has experience with developing web and mobile applications, having spent years working with them. Joshua now finds his spare coding time spent deep in the trenches of VR, working with the newest hardware and technologies. He posts about what he learns on his personal site, where he talks mostly about Unity Development, though he also talks about other programming topic that he finds interesting. When not working with technology, Joshua also enjoys learning about real estate investment, doing physical activities like running, tennis, and kendo, and having a blast with his buddies playing video games.